Berliner Wasserbetriebe is Germany’s largest municipal water supply and wastewater disposal company, supplying drinking water for 3.5 million people. Diehl Metering was commissioned by Berliner Wasserbetriebe to implement an extensive drive-by solution, enabling exact reading date consumption values to be recorded and making the process considerably more efficient in the process. Berliner Wasserbetriebe has updated the system for reading the water consumption data for Berlin’s biggest housing association, degewo. Data from all water meters is transmitted securely and automatically, irrespective of accessibility. The staff at Berliner Wasserbetriebe now collect consumption data in drive-by mode – fast and precise. degewo is Berlin’s biggest housing association, with over 75,000 apartments to its name, and it is also one of Berliner Wasserbetriebe’s most important customers. The starting point for degewo’s cooperation with Diehl Metering was the company’s decision to optimise its service for tenants and improve the in-house consumption management system. The previous procedure used to take manual readings from mechanical water meters was an extremely expensive, time-consuming and labour-intensive process. It also required consumers to be present or for them to make arrangements with neighbours to allow access to the meters. Added to this was the risk of transmission errors, which cannot be avoided when taking manual readings. This method proves extremely inefficient, particularly over long distances and with the typically high volumes of traffic found in Berlin. The first step was to install 1,700 ALTAIR piston flow meters and fit them with attachable radio modules to make them into smart meters that send out a signal every eight to twelve seconds. With a radio receiver and a mobile reading device, consumption data can now be recorded by Berliner Wasserbetriebe staff driving by at up to 50 km/h. When the reading device is then synchronised with IZAR@NET software, the data is automatically transmitted to the water supplier’s billing system. In the subsequent phase of the project, Berliner Wasserbetriebe fitted their 50,000 shafts with radio-enabled HYDRUS ultrasonic water meters that were integrated into the existing drive-by solution immediately after installation without the need for parameterisation. Looking to the future, it would also be possible to automate the reading of smart water meters via a fixed network at any time. Combined with IZAR software, this would enable the entire water network to be controlled and monitored, enabling the detection and localisation of leaks. 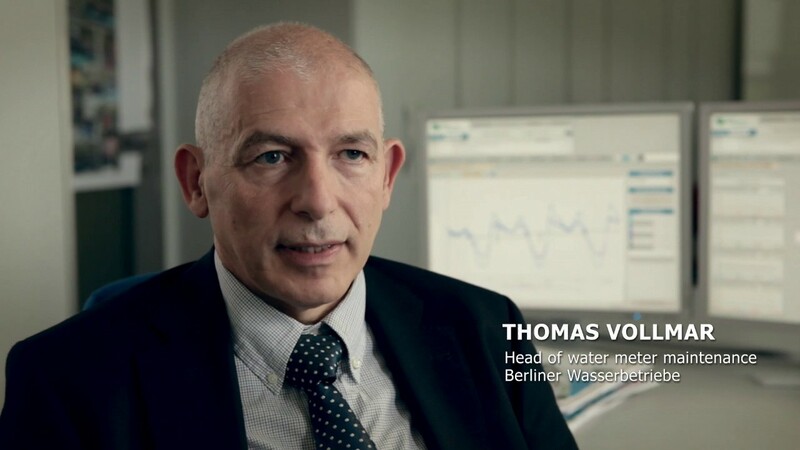 For us at Berliner Wasserbetriebe, the focus was very clearly on making significant improvements to the services we provide as well as to our customer service. After the meters were initially installed, we took a test reading using the automated Diehl Metering solution and received a success rate of 99.9% the very first time. New efficiency: 100% of meters can be read reliably. And in addition to the reading date values required for issuing utility bills, the new mobile solution also provides degewo with up-to-date meter readings and diverse current values for the measurement points. Consumers only get billed for their actual consumption up to the reading date – which has already drastically reduced tenant complaints. From the collection of meter readings to the transmission to the Berliner Wasserbetriebe billing system, the whole process is significantly faster, safer and more reliable. A triple win: for Berliner Wasserbetriebe, degewo and the housing association’s tenants. With our tailor-made, high-performance, future-oriented solution IZAR PLUS, Diehl Metering is responding to legislative requirements as well as country and market-specific features. The limitless flexibility and upgradability of IZAR PLUS leaves all options open for smart metering, home automation and e-mobility.